Buy this product and get a FREE Knife Care Kit worth £30! No need to add it to the basket, we’ll simply include it in your delivery. 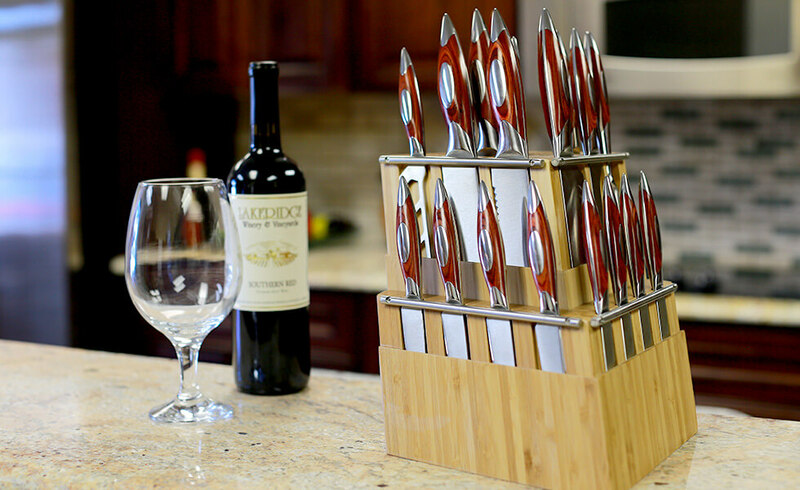 This beautiful set not only looks stunning but has a knife for every occasion, including a detachable block of steak knives. 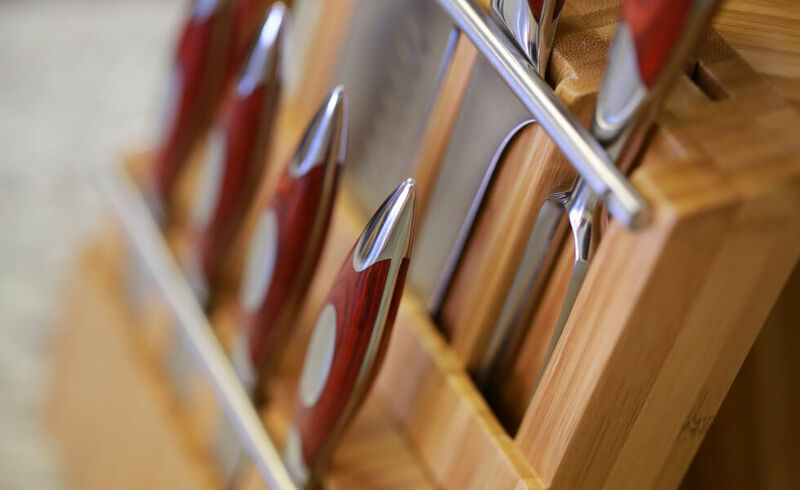 Held and displayed in a stylish wooden knife block, you’ll find everything a kitchen needs, from a bread or cheese knife, to a carving set, utility knives and a range of versatile Santoku knives. Slightly larger than most, the 9” Carving Knife will tackle all types of joints, roasted poultry, fowl and even a hog roast. 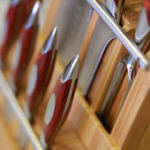 The larger blade means less sawing and less scoring on your topside joint as you slice it. 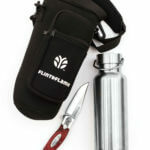 It has a razor-sharp point, making it ideal for both boned and boneless joints. The Carving Fork makes carving and preparing sliced meat so much easier, allowing you to focus more on getting a good even cut. 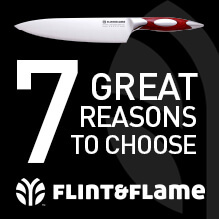 Flint & Flame’s Bread Knife is quite unique, we use what is known as a rolling serration or scalloped blade. This gives you a cut instead of a tear which is what you often get with a conventional bread knife. 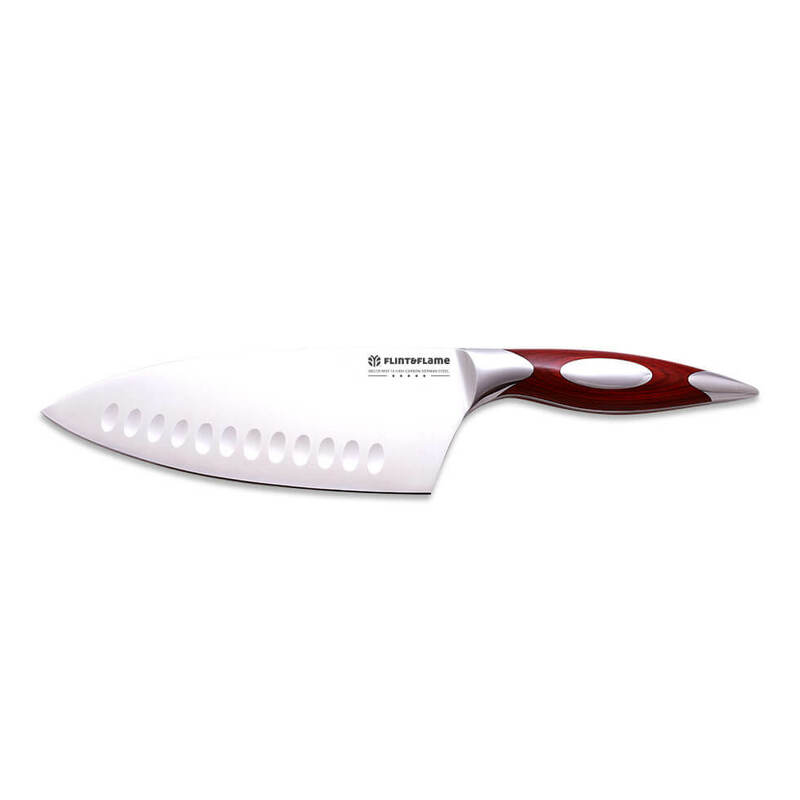 This hybrid knife combines the best features from both the versatile Santoku and the traditional heavy-duty Cleaver to offer a precise and efficient way to cut meat and vegetables alike. The deep blade makes this knife very safe to use and the sharp point is brilliant for scoring. 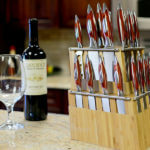 The knife is strong enough to cut through tough meat and poultry bones, as well as being light and versatile to serve as your everyday chopper, slicer and dicer. The bigger brother of the 6” Santoku. Being that little bit bigger, it will do a little bit more of the work for you. A better tool suited for your cabbages, swedes and squashes. Cheese Connoisseurs will appreciate this knife’s double-sided serrations; you’ll easily be able to achieve consistent slices, even on the hardest of cheeses. 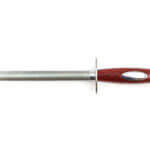 Its fine and flexible blade makes it fantastic for gutting and filleting any type of fresh fish. With its flexibility, it also gives you leverage to perform very fine slices, making the painstaking job of preparing smoked salmon a breeze. What’s more, this knife will perform tasks on tender meats such as lamb, effortlessly slicing a joint into noisettes for a gourmet lamb dish. 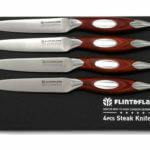 A set of exquisite Steak Knives which will add a distinctive look to your home dinner table or restaurant. 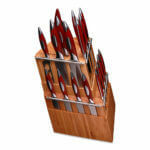 Tucking into your favourite cooked meats has never been easier than with this set of 8 Steak Knives. The perfect addition to any dinner table. 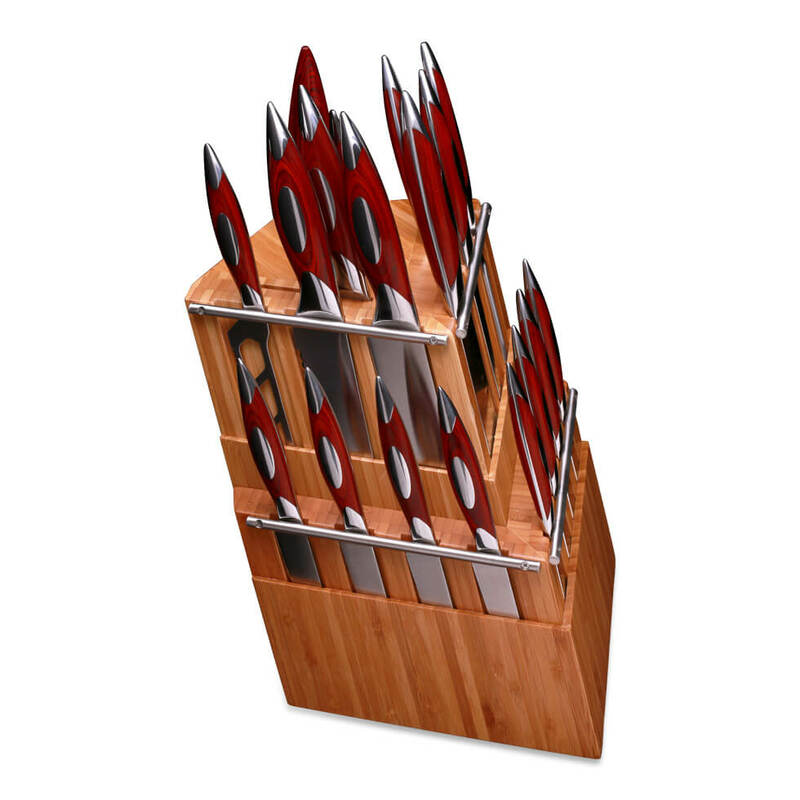 The blocks are divided in such a way that the steak knives can be separated from the rest of the set and displayed decoratively elsewhere. A very useful vegetable knife and a must for every kitchen. Being a short blade, it is perfectly designed for peeling your potatoes, stringing your runner beans and tailing your sprouts. 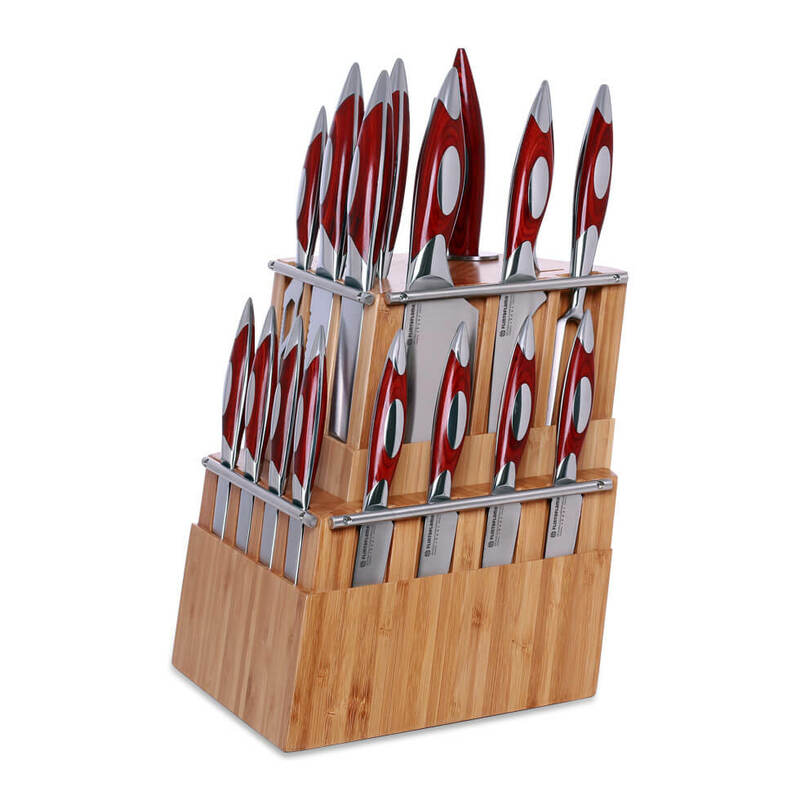 This set is an incredible addition to any kitchen, with a huge array of knives included, there won’t be many dishes you don’t have the means to prepare. 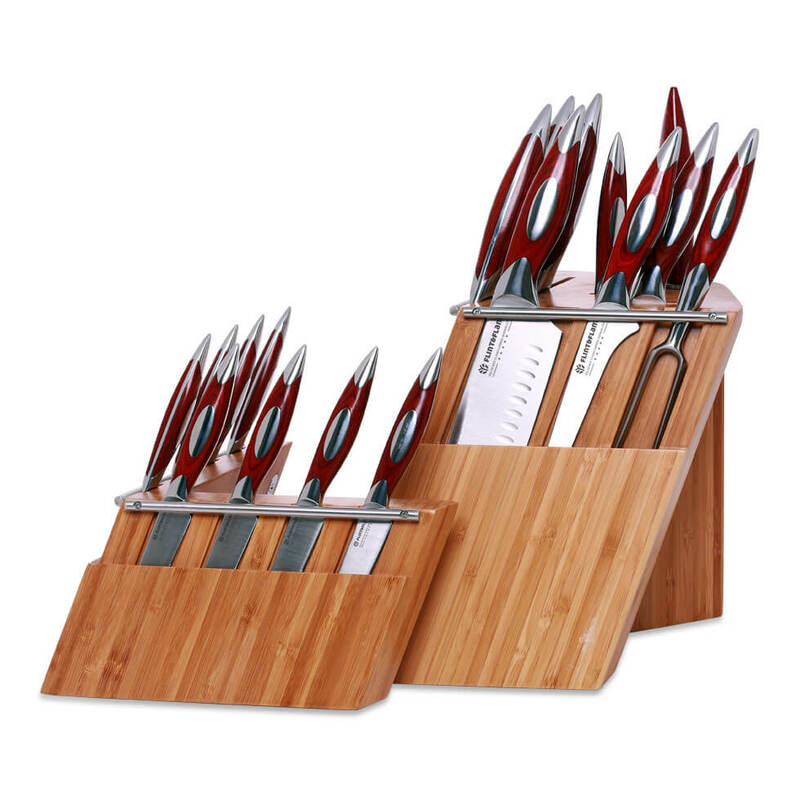 Whether it’s for a professional chef or amateur home-cook; a gift for a loved one or a treat for yourself, this set is guaranteed to please.